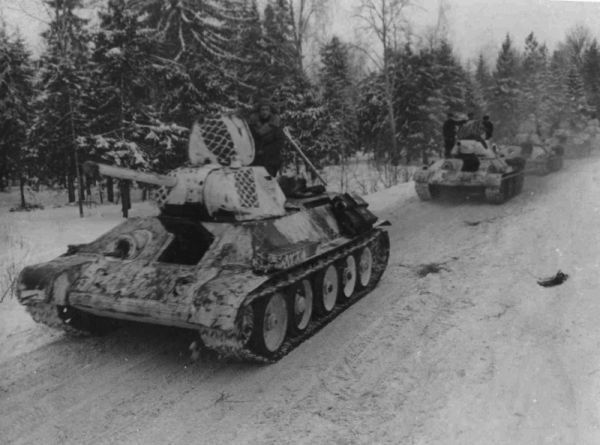 Dice Devils GC: Soviet Army: T-34 Winterizing. Close-up of the IS-2 slogan-age, or is it slogan-ry? I've seen black and white photos, but this one is color to show what it will look like.. winter, very weathered. Here is another color shot. Looks like the turret white was touched up, as it isn't worn at all. Note to Lothlann, I guess not ALL Soviet tankers wore blacks! Whats the deal with the "track marks"? 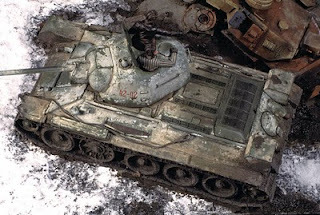 I have seen many pics of this camo on Winter War (Finland) T-34s.. This pic is the closest to what I am aiming for. Tankers blue overalls were used till 41 then then switched to grey in 42 and black in 43 and stayed black till the end of the war. Due to short supply though some wore there uniform which some wore under the coveralls. The turret probably wasnt touched up the rest just rubbed off because of getting into and out of the tanks. Enigma codes have been hacked!